I had my first book signing yesterday. 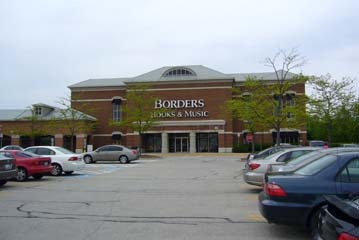 It was at a Borders in Chicago. I didn’t have high expectations. My reason for doing book signings isn’t just about selling books at the store, it’s to gain additional media exposure through reviews and author interviews. If I happen to sell a few books at the store, then that’s great for everyone. But that’s not my main goal. I sent out over thirty press releases to various media outlets in Chicago. I didn’t get any love from the Chicago media. I am aware of only one mention in a local paper. I did advertise the event at a number of other outlets including booktour.com, my web site, and this blog. I also mentioned it on gather.com. Still, I had no delusions that there would be people lining up outside the door. 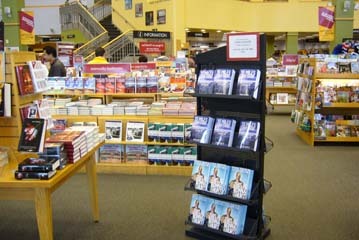 When I walked into the store, I was pleasantly surprised by the nice display that had been set up for the book. It was the first thing anyone saw when they walked into the store. It was so close to the entrance that it could also have been considered an obstacle. You had to walk around it to get into the store. But you certainly can’t complain about front and center exposure. 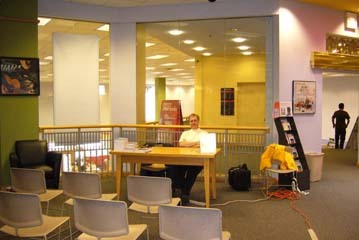 My book signing, however, was to be upstairs. So after checking in with the store manager (who was in a meeting and relayed instructions to a store employee through one of those earpiece communication systems), I headed upstairs to set things up. I had brought a number of things to attract attention. 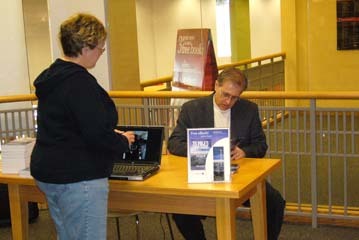 I had a laptop that had a self running slide show that displayed images of the actual people involved in the accident; I had two life vests, one of them was a life vest from the actual ditching; I had a small display where I was giving away bookmarks and free eBooks to anyone who purchased a printed version of the book. One thing that I had considered bringing but forgot was a tray of cookies. I have read various arguments for and against this. The pro stance is that by offering treats you’ll get people to stop by who might not otherwise stop by. The con stance is that all you’ll end up doing is wasting money on feeding people who have no interest in your book. Like most two story Borders the upstairs was dedicated mostly to music, which meant that there wasn’t much in the way of traffic. In fact, there was hardly any traffic. The setup upstairs was perfect for a lecture type presentation. It was quiet and there was lots of room. But I was doing a meet and greet type of book signing. So I grabbed a bunch of bookmarks and headed downstairs. My first plan was to hand out bookmarks to every person who walked into the store. But then I realized that I’d run out of bookmarks in ten minutes. So I changed my criteria. I would only hand out bookmarks to people who stopped by the display to check out my book. Sure enough within a few minutes a lady stopped by and picked up a book. Before I could even offer the bookmark she told me that she wanted to buy the book. So I told her to pay for the book and meet me upstairs. This was my first book signing and my first sale, so I wanted to document the occasion. I had one of the store employees take a few pictures. No one else was around. Turns out the woman, Debbie, was working as a volunteer at the store wrapping books as gifts for Mother’s Day. She hadn’t traveled across town specifically to have me sign a copy of the book. And she wasn’t buying the book for herself but for her son who was a pilot. But hey a sale is a sale. As it turned out, it would be my only sale of the day. With my first sale on the books, I headed back downstairs with renewed confidence. I stood by the display waiting to hand out more bookmarks. Most people walked by the display as if they were ticked off that they had to walk around it to get into the store. One kid about nine years old grabbed a book and was reading the back cover. He was waiting for his mom to pay for a book. When his mom called out his name, I handed him a bookmark before he ran off. I think he got yelled at for talking to a stranger. At one point I spotted a lady speaking to a store employee. They both looked my way. I smiled. They started walking toward me. Finally, someone has come specifically to meet me. When they were a few steps away from me they stopped and the employee showed her the book she was looking for. It was Barbara Walter’s Audition. Barbara Walter’s has sold over 850,000 copies of her book in one week. I would have been happy if I would have sold eight copies of my book. There weren’t many people stopping by the display, so I headed back upstairs. It was lonely up there. A few people, sympathetic with my cause, stopped by to chat. But they were looking for books to give as gifts to their moms. A book about an airline ditching wasn’t high on their list. I heard one woman tell her husband, “that man over there is the author of that book 35 Miles From Shore.” The man looked at me with the same interest as someone looking at a gorilla at the zoo, and that’s kind of how I felt. A few minutes before my signing was scheduled to end, I started to pack things up. That’s when it happened. My laptop blew-up. There was a spark and a popping sound and then the screen went black. Up to this point the whole book signing had cost me less than $50. I’m a pilot and can travel for free. My only cost was the rental car. I haven’t had time to take the laptop in for repairs, but I’m guessing that it isn’t going to be cheap. So the bottom line is that this particular book signing didn’t pay off; no media coverage, one book sale, and one blown-up laptop. I’m not going to abandon book signings because this one didn’t pan out. I did leave behind a few autographed copies and I’m sure a few more books will sell between now and when they return the books that didn’t sell. Some of the other book signings I have scheduled have already panned out with additional media exposure including a scheduled TV interview. I’ve found that smaller markets seem to be more receptive. All in all it was a learning experience. I never did meet the store manager. I bet if I were Barbara Walters he would have found time to come and introduce himself. The next time I’m going to bring along some brownies. Can’t hurt.